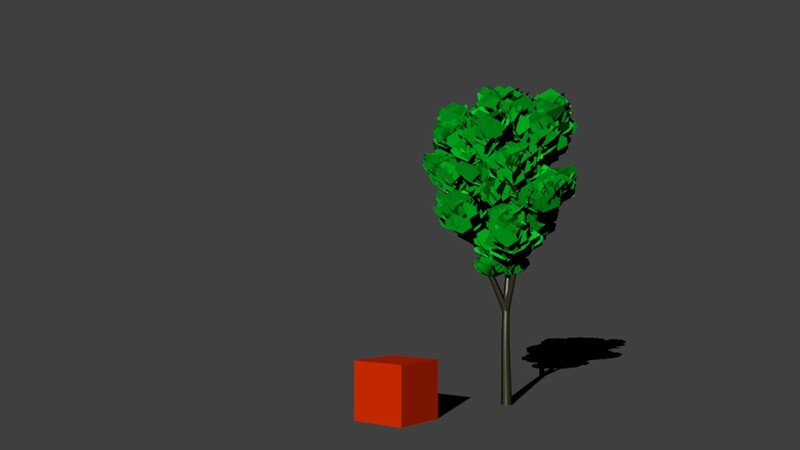 I have been working on implementing the tree model described by Jason Weber and Joseph Penn into Blender. This model has proven popular and is used in the tree generator Arbaro and the Blender 2.49 plugin Gen3. Start Blender and go to FILE -> USER PREFERENCES, in the window that opens click on the Add-Ons tab. Click Add Curve in the list on the left. Check the box next to the ‘Sapling’ add-on. Have fun playing around with the options! Fixed preset path to work with user defined script location (code thanks to Sanne). Fixed limit import to work correctly and not export limit import value. Fixed radius calculation issue to correctly implement the weeping willow preset. Fixed presets to have all parameters correct in the preset file. Added presets for CA Black Oak and Weeping Willow. Automatic armatures have been added so it is possible to generate an armature and bones for the whole tree easily. 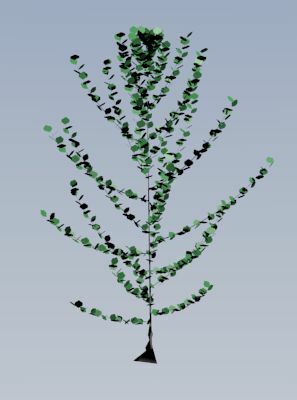 This includes the leaves which also have vertex groups to make sure they stay attached to their branches. Automatic armature animations have also been included to add wind to a tree automatically. GUI updated to make it smaller, a drop down box within the panel now allows access to each section of tree parameters. They are in the recommended order of editting. PruneRatio has been added which allows for adjusting the amount of pruning applied. A better visualisation of the pruning envelope has been added to make it easier to see the shape that you are forcing the tree to take on. Leaf generation has had some corrections which should also speed it up. Comments on the code have been added for those interested. I am happy to announce that ‘Sapling’ is ready for a first release (v0.1) and can be found here. This was written using Blender 2.56.6 r36007 (RC2). You can adjust the quality of the tree at any time using the ‘Preview U’ and ‘Bevel Resolution’ option in the Object Data section of the properties panel. You must tick the ‘Bevel’ box to see the actual tree. You must tick the ‘Leaves’ box to generate the leaves. You can change ‘Levels’ to see only the level you are editing (and the ones below it). You must tick the box ‘Prune’ if you want to enforce a shape on the tree. The tree which is created by default is the ‘Quaking Aspen’. Flaring of the trunk is not yet supported, I am currently looking into this. Periodic tapering of the branches is not supported and is unlikely to be due to limitations of using curves for the branches. Wind sway is not yet implemented but is the next item on the to-do list. 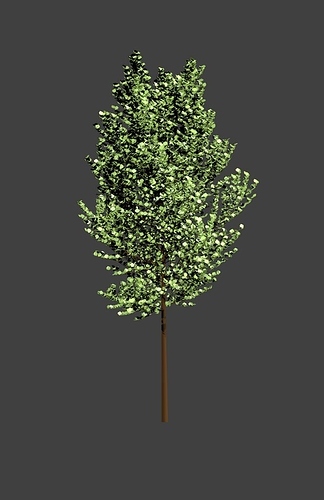 This tree has about 180k verts but as described above, this can be adjusted. If there is enough interest I might create a tutorial explaining all the options and how to use them. Please feel free to leave any comments and suggestions as well as bugs to I can try to get them out of the way quickly. Wow , nice to use ;-)!!! Question: what should one do to make the leaves be fixed to the twigs and move in the wind? Some very nice additions to the previous script. I like the split feature a lot. Pruning is nice as well. It did not crash at all. The only unexpected operation that happened was when I typed in a number in one of the fields then pressed CTRL-Z (to undo) the entire panel disappeared as well as the tree I had spent much time on. That is probably more of a Blender panel issue, however. But if you have anyway to deny the panel exit if a CTRL-Z is pressed it might be nice to add. Very cool script… ground my win32 shitbox to a halt with too many branches and leaves. I have a suggestion for setting up your properties. In an addon I’m grinding away on i started using xml data to store the default settings that the user changes in an operator and preserve these settings for the lifetime of the blend file or to disk. I think this method or something similar has application here giving an easy way to save your settings as presets like “Oak Tree” or “Rasperry Bush” etc. Saving them to a file makes them available to your next file. The xml data could be served from/to a webserver with a collaborative database. Or easilly added via the text editor. The snippets come from a multiple script addon in a directory “MocapMadness” . init.py takes care of the importing and calling the register method of each script. In the config.py script the settings are loaded from settings.xml. Now in the operator.py script the operator class. The methods above are called to generate the operator’s properties and are set, and saved (to file if desired) in the invoke and execute methods. I haven’t been using vector properties, the code for them needs to be set up. bl_label = "Load BVH file (.bvh)"
The data is set up like this and holds the default value of your properties. You use expressions from the math lib and blender props like bpy.context.scene.render.fps. batFINGER: This is exactly what I would like to do, but up until now didn’t know how to. It’ll take some work to get this set up so it might not be introduced for a while but it is now on my to-do list. Thanks for the great examples. Make sections of script’s UI collapsable so they don’t take up so much room in the tool shelf. Add edit bones to an armature without using bpy.ops. There’s a ‘default collapse’ or something like that so it doesn’t show the full panel, just search the ui directory for one that is collapsed by default. But the armature needs to be in editmode and if you don’t set the head/tail blender will delete your zero-length bone (IIRC). But since your panel relies on the draw of the operator it might pay to set up a buttons for tabs kinda thing using some dummy display properties and display for that selection in the draw method. In the snippet below your “Branch Growth” box will only show once bevel is True. Thanks Uncle, I’ll look into the panels. With respect to the edit bones, my question was phrased poorly. I have used the method you describe, but unfortunately it requires bpy.ops to enter/exit edit mode, that was the main problem, not actually adding the bones. I have a suspicion there is no way to add bones without this enter/exit op. Good idea this one, I’ve used an EnumProperty to drive the visibility instead of a boolean to it works like it want it to. Thanks for the idea. Yep, I think that’s the only way it works due to the way blender stores armatures internally (it creates edit bones when going into edit mode and destroys them when leaving). Here is a quick update on what I have been working on. This animation is completely handled by the script using only fcurve modifiers. No keyframing required! The parenting, vertex groups and armature modifiers are also all automatic. I’m currently trying to clean up the code and add more useful comments. A new version including all these features should be available soon. I was testing it out the other day. thanks, I look forward to the next version. awesome, but need a second motion for the leafs. It would be good to add this to Blender contrib scripts & svn. You can start the proccess easily with a Projects & Wiki page & we can provide you with a good developement enviroment. I can provide any help you need setting this up. Thanks, what a cool script. Version 0.2 has been uploaded, see the first post for the link and a list of the updates. Thanks for the support too! This would be great! I’ll have a read through and get back to you with any questions. Here is a tentative update for the tree generator. I have been working on allowing saving and loading of presets and thus needed to move to a multi-script add-on. The zipped files can be found here. To install, unzip into the addons directory of your Blender distribution. Then go into User Preferences and enable ‘Sapling’. I won’t update the main post yet as I would like to get any feedback that anyone has before making a new release. I will also look into putting up a wiki page for this. PS The preset options are available at the top of the panel. Two presets are included, the Quaking Aspen and the Black Tupelo. Enjoy! As it is spring, here in Ohio, I see lots of trees moving in the wind and I do have to agree with bat3a. A secondary movement on the leaves would be a nice addition.